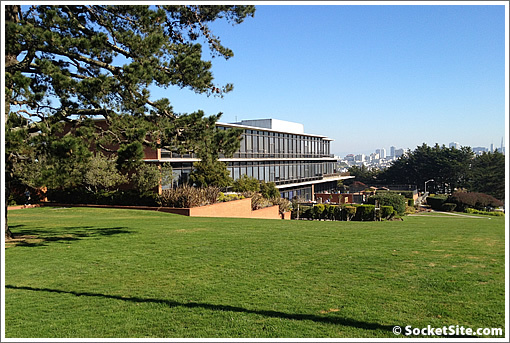 While SKS Partners and the Prado Group have been pushing forward with plans to redevelop the 10-acre Laurel Heights campus at 3333 California Street, which it has acquired from UCSF, a bid to block or delay the project has been made. 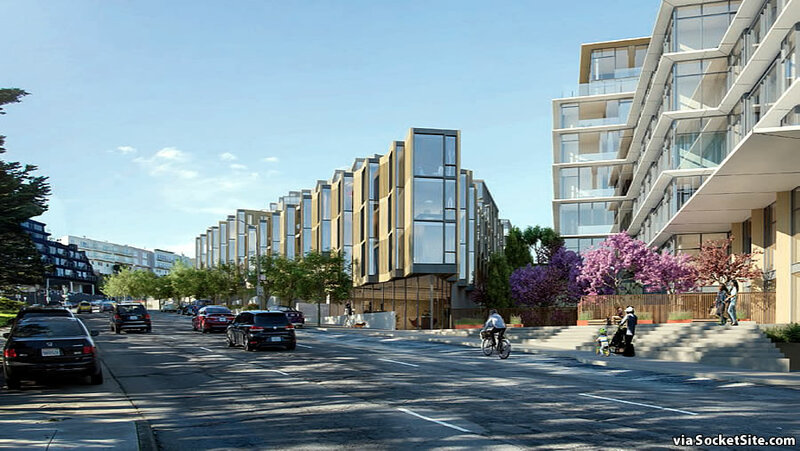 As proposed by the Laurel Heights Partners project team, portions of the existing 455,000-square-foot office building on the site would be demolished, the remainder of the central building would be split in two, expanded by two floors, remodeled and repurposed, and 13 new buildings, including 7 duplexes fronting Laurel Street, would rise up to six stories in height across the campus site. 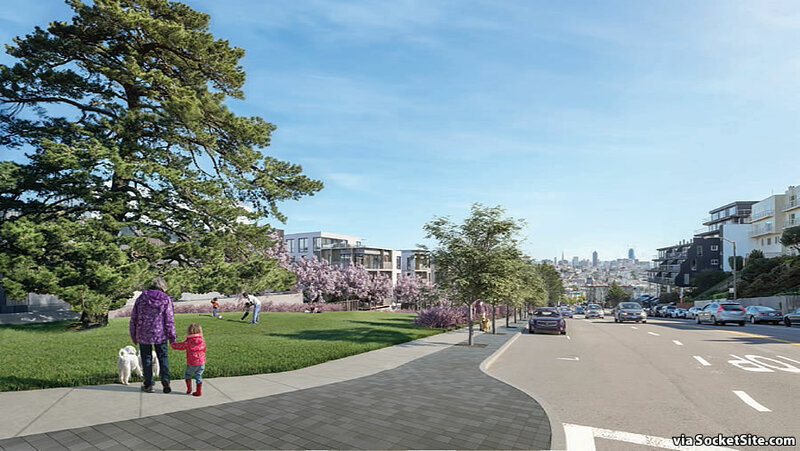 The proposed redevelopment would yield 558 residential units; 49,999 square feet of office space; 54,000 square feet of retail space; a new 15,000 square foot child care center; parking for 895 cars (and 693 bikes); and 236,000 square feet of open space, including the Masonic Plaza as newly rendered below. And as currently envisioned, the project would be constructed in four overlapping phases over the course of seven years, with the first phase breaking ground in 2020 if the entitlements to proceed are secured. All that being said, the Laurel Height Improvement Association (LHIA) has now formally nominated the existing modernist building and campus on the 3333 California Street site, which was originally developed for the Fireman’s Fund Insurance Company circa 1957, to be listed on the National Register of Historic Places. Really think they should have made the property denser from a housing perspective. The space with duplexes seem a little underutilized; otherwise, seems like a great improvement assuming most of the property does go up to 6 stories. Also, I hope some of the (underground?) parking also includes spaces for the shops next door. If the building does need to be persevered, does that mean that they just need to not divide the building in half? I doubt the rest of the changes to the property will be affected. Other than just being plain annoying (and maybe getting some money on the side) I don’t really get what LHIA wants from this action. I have had visitors from 3 different states during the last few months. I found myself repeatedly apologizing for the trash everywhere, the drug addicts on the streets, the potholes, and the endless traffic. The prevailing feeling of my guests was that our city is busting at the seams. There is no evidence or research that supports the assertion that we can build our way out of these problems. Adding more people, more housing, more concrete will only exacerbate our problems. Fix the infrastructure, help the homeless and mentally ill with adequate services, improve the public schools so families want their children to attend and don’t have to flee to Marin or the East Bay, clean up the trash, solve the drug problem, plant more trees, end the political corruption, hold the City government accountable for how they waste your money, then and only then co template how to intelligently add more people and housing to this once great city! Cities around the US are scrambling to correct the mistakes of “postwar decentralization and suburbanization” to battle climate change, increase economic opportunity and improve all around quality of life. Bold move LHIA! Thank you for so well articulating what i was thinking but am too bamboozled to get out by what I was reading. The timing of this makes it appear that they are just trying to stop any redevelopment of the property. I fail to see it’s merit as historically significant, but I am no architect just an average Joe. 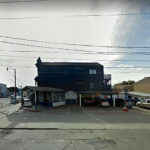 Honestly, the development proposal – token “saving” of (only) part of the building, and the obliteration of its context – is probably one that would be embraced by Solomon…but should be rejected by everyone else: either preserve the site more/less intact and redevelop it accordingly, or just level it. No point in preserving a desiccated corpse. I don’t think their intention is to keep part of the building for preservation’s sake, but rather part of the building is good enough to reuse and add a couple of floors on top. If it’s good steel frame construction it may be a cost effective way to redevelop the site. Perhaps – tho after you’ve stripped to the frame, beefed-up the shear bracing and done whatever else is needed to meet code I would think you’d want to do more than add (just) two floors – in which case I guess the idea should be judged on its own merits. LHIA is the same group that refused to let the UCSF move research labs into Laurel Heights which resulted in UCSF wasting millions of dollars on litigation, never moving more than one lab into LHts and setting the stage for LHts being where UCSF would toss random groups it didn’t have other space for. The buildings are awful, leaky, costly to maintain and generally miserable places to work. Thanks LHIA for always being there to waste other people’s time and money. the LHIA doesn’t even have a working website. clearly an anti-development bid given the timing. it’s crazy some random group of nimbys can actually put something on the historic register in such short time. The developer should consider adding more affordable units, and applying SB35. Wouldn’t that give them 2 additional stories and avoid all the lawsuits and delays? The head of LHIA is a John Rothman (yes, the radio guy from KGO), who has lived in the neighborhood just about forever and refers to himself as “The Mayor of Laurel Heights”. He has opposed every change ever proposed for that neighborhood. I lived in that area about 15 years ago and knew him then – he put himself in charge of everything and would fight every attempt to modernize the area. He wants it to remain the suburbs it has been since he moved there. He’s politically skilled (he worked for Nixon, Quinton Kopp, MIlton Marks, etc…) and knows his way around the bureaucracy, but I know this man and this is very much a NIMBY move. 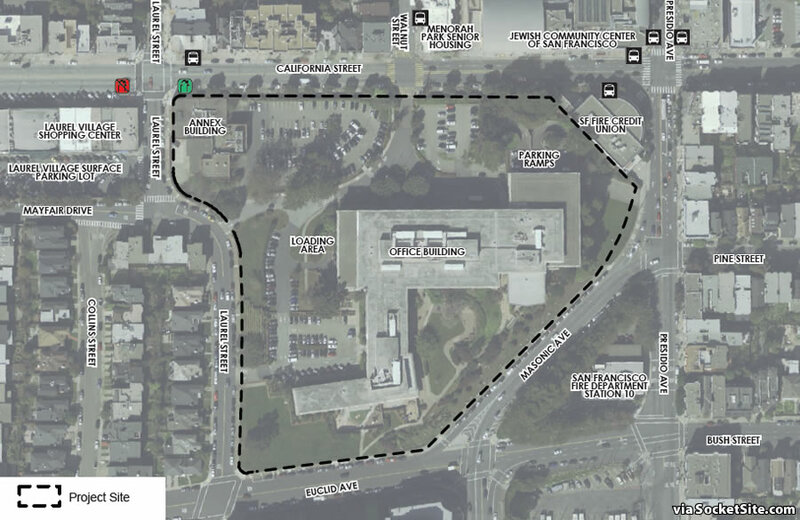 What must his position be on CPMC’s plans for its California Street campus which Planning is urging be even denser? I believe Rothman lives very close to the Euclid Green. The no development on that corner may have been an attempt to buy him off. He lives on the corner of Laurel and Euclid. You would think that “the embodiment of postwar decentralization and suburbanization of San Francisco” would be the exact kind of thing we want to tear the hell down today rather than entomb for future generations to marvel at the error of our ways, yet here we are. And even with this project, it’s still not adding that much housing compared to the number of jobs from the office and retail spaces. Mixed use developments are great, especially ones like this that have walkable retail nearby and good transit access, but we should be building projects that bring us large net housing gains even after accounting for the job growth of new offices space. We need housing growth to outpace office development, at least for a little while. Too bad they can’t follow the same designs as the CPMC redevelopment near by. That one is actually a beautiful project. Over simplifying here, ok, so the building is landmarked, they analyze an alternative in the EIR (which they’d be doing anyway? 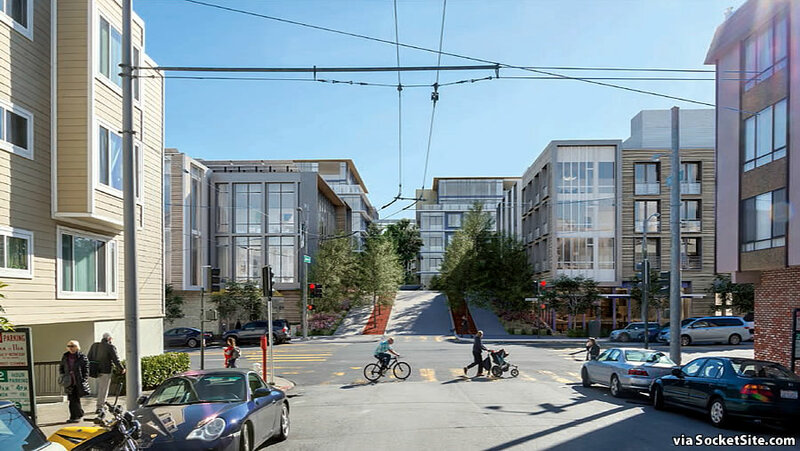 ), find the alternative doesn’t meet the objectives and the regents certify the overriding considerations (as a ground lease, the UCSF is the lead agency?). a few more hoops, but finding it hard to believe there’s a strong constituency to actually save the building, plus the nomination criteria seem awfully weak. Sigh. The Laurel Height Improvement Association (LHIA) – rich self entitled corporate attorney nimbys. You could come up with a solution to world hunger or cure for cancer and they would be against it if it involved any changes to anything anywhere near “their” neighborhood. Post Parkmerced nothing is really protected. Sad to see they have no options to retain which is the most environmental option. 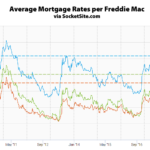 Make it 100% affordable // they have too much high cost housing in that part of town and D7 D10 and D11 should not bear the brunt of redevelopment. Add D6 to that listing…why is our district considered the “dumping ground” for every rehab/detox clinic. Let’s put some landuses like that in Laurel Villiage, now that ought to wake up the neighborhood…maybe they would be more responsive to housing if offered that as an alternative. We were supposed to “protect” Park Merced? At least at this site the preservationists have a few valid points. No mention of the architect (John?) Page, who was not a master architect. My first architecture job was in the successor to his firm, though he was dead by then. The firm also designed the Fireman’s Fund building near 101 in Marin. 895 parking spots is ridiculous. Why is that ridiculous? It is not on a BART line or even a Muni line save for bus routes. Office space, retail space, a large childcare center and almost 600 units of housing. Why do you want parents to be forced to schlep their kids on a bus? I have to disagree with your characterization of the service to this site. Even in the middle of the day they get 16 buses per hour in both east and west directions, and 9 per hour in both north and south. 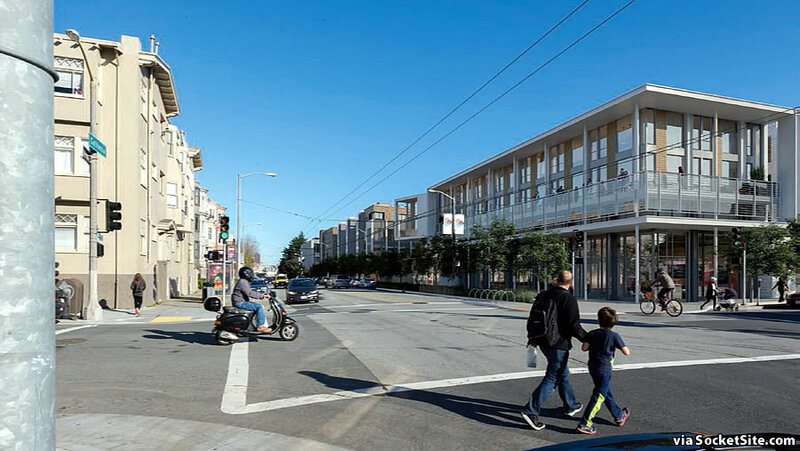 This corner enjoys 5% of all Muni service, has an express bus line, and is a 500-yard walk from Geary which enjoys a stupefying level of bus service, 21 buses per hour per direction plus the 38BX express line, which is another 13% of all Muni service. In other words this is one of the best-served transit locations in the entire city. As I said – just busses, which you have confirmed, so not sure what you are disagreeing about. I’m disagreeing with your pejorative characterization of this transportation situation as “just buses”. There is better transit service here than most places served by Muni streetcar lines. The buses are SRO by this point – certainly at rush hour. Saying someone should rely on the 38BX or 1BX to get downtown is not realistic. And even the “best case” bus service is ~30 minutes to downtown; that’s just outlandish given the short distance involved. It’s sad if you think that passes for acceptable public transit. And you propose what? Adding a bunch of car parking will somehow improve the bus service? A voice of dissension: I love the look/feel of this building. It fills the property beautifully, with lines that are a great example of mid-century minimalist architecture. I was saddened when I read of it being torn down, and truly hope it can be saved. And no, I do not live in Laurel Heights nor am part of the filing. Just a fan of architecture. I agree and would like to add this… Why do we need to make everything housing? Yes, there is a need for people who want to live centrally in SF but not everyone can. Cold hard truth. It’s been that way since I was a child and those who couldn’t afford to live in central areas either moved to outer districts or not within the city limits. Commute was not considered a four letter word, and people dealt with not being able to live centrally instead of whining. 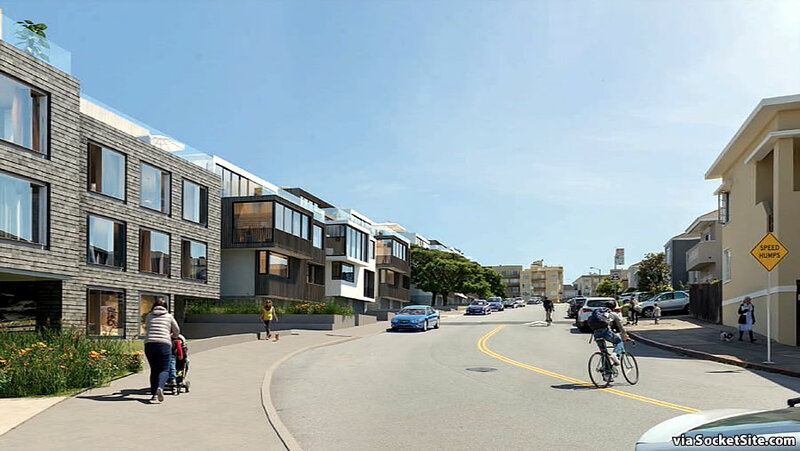 The current trend of building so quickly for increased density isn’t being done thoughtfully and is altering our beautiful city with generic buildings and overcrowded public transit lines; I think it is time for SF to put on their big boy pants and take a breather to really look at the impact of these actions. The reason “everything” needs to be housing is because in the last 30 years San Francisco has built office space for a million jobs and only enough housing for about 50000 people, which is causing severe transportation problems throughout the Bay Area. San Francisco needs to come correct by building enough housing for their workforce, otherwise they need to start demolishing office buildings. The rest of the region and the rest of the state are not going to subsidize SF forever. And then in a soma where powerless working people reside the city drops 400’+ residential hub monsters on the old Goodwill site (so.van ness/mission) next to 45′ residential across mission and when the neighbors ask for better transition between the two heights are told to f -off, more or less. The landscaping firms’ contribution is a major influence. Garret Eckbo (who was in charge) was the major advocate for the California indoor-outdoor concept in the early 50’s. The quality-of-life in the form of trees in the city needs to be addressed. All those trees to be bulldozed is not a good thing. Call me a tree hugger, but this concept to just build, build build should be built AROUND the landscaping. Beautiful California coastal oak trees and California redwoods mean carbon is being absorbed, Look him up for style and consider this also for scientific causes. There can be density AND nature or we’re un danger of building a concrete maze of San Francisco. Build up and about these trees. Also remember that SF is loved around the world for it’s juxtaposition of city/nature. I also love the architecture but the density question just seems to too ignored. LHIA has a direct line to the Telegraph Hill Dwellers Association. It appears everyone has forgotten this entire site was a cemetery where the occupants were to rest in eternity – and we ll saw how that worked out. Cremation for me. um … What?! What does the fact this used to be a cemetery have to do with how to address its use and development today? 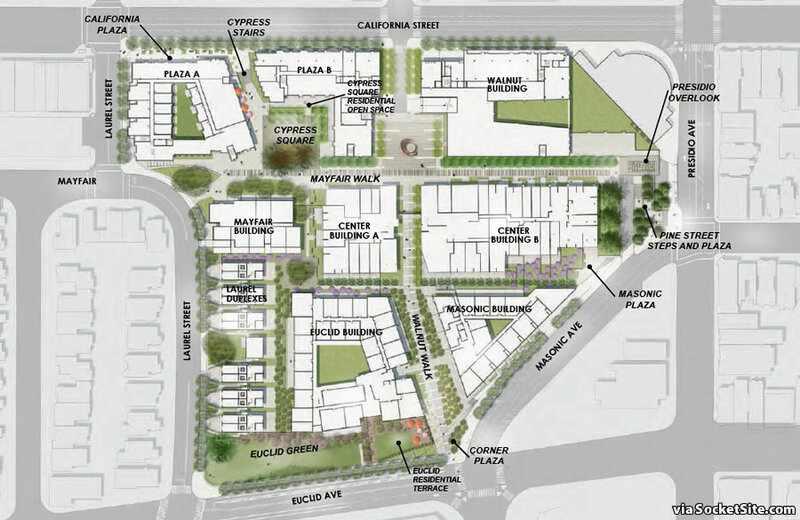 Why do these planned developments (City College development, Laurel Heights, various Hays Valley projects, even the affordable housing blocks on Bryant and elsewhere) have to isolate themselves from the street grid with paseos and gateways, etc.? For example, referencing the first photo, why not put a street from Bush up the hill ? To me this just perpetuates a suburban effect and fails to embrace urban connectedness and integration.